Now we are a couple of months into 2014, I thought it would be a good time to provide an update on my progress in the garden so far. The rhubarb that I had left neglected in a pot came back to life in early January. This was the beginning of the growing year for me, the first of my home grown produce that would make it to the table. I promptly replanted it in a sunny spot where it would have plenty of room to grow and decide not to force it this year. During the storms half of the shoots were destroyed, more likely by blowing debris than the actual wind itself. Either way a bit of a set-back but it seems to be recovering well now and the shoots that are remaining are continuing to grow well. Broad beans were the first of my seeds to be sown indoors and after about five weeks they were ready to go out. I covered over a large section of the veg patch with black polythene for a couple of weeks prior to planting, both to dry it out a bit and also to warm the soil. The broad beans went in against the back fence where they wouldn’t shade any of the other veg and might even provide a bit of a windbreak when the other seedlings go in. They grew taller and thinner than I would have liked, mainly due to poor light levels even on the windowsill so when planting I put canes in and tied them for support, in an effort to stop the wind from getting to these too. This was two weeks ago and they’re still there, I wouldn’t say they are going particularly strongly but they’re hanging on. I don’t expect too much growth while the roots establish but I will be keeping a close eye on them from now on. As a crafty back-up I pushed two more broad beans in on the opposite side of the canes so even if the first plants don’t make it these should germinate and become my plan B.
Shallot sets have been planted in the raised beds which I am still waiting to sprout, a couple of drier days should help them but we don’t seem to have many of them at the moment. Still they are fine where they are and should start to grow any day now. Other jobs outside have been pruning and weeding old raspberry beds, I narrowed them down to being summer fruiting raspberries as opposed to autumn so more of a tidy then a harsh cut back. Gooseberry bushes have been relocated from pots into their own bed, and a herb garden has gone in alongside the dry stone wall to compliment and enhance all the veg in the kitchen. The leeks and lettuce that I brought with me were put into the raised beds. I am currently experimenting on the lettuces with cloches, half have the top half of a used plastic bottle over them and the others have been left exposed. The idea being that it stops wind and hail damage and reduces the amount of rainfall onto an already saturated plant; it’s like an individual greenhouse so may even warm the plant up a bit too. Early days yet with no real difference between the two, of course I’ll share any results when I have them. Inside I have my salad tray which will provide me with cut and come again leaves. 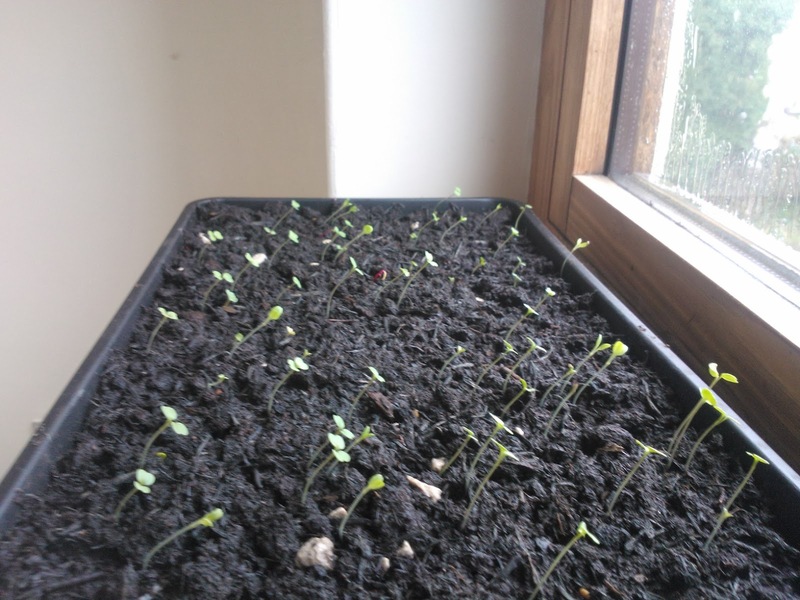 This was only sown about ten days ago and already looks similar to one of those trays of cress you would grow as a child. Very encouraging and probably my biggest success yet. 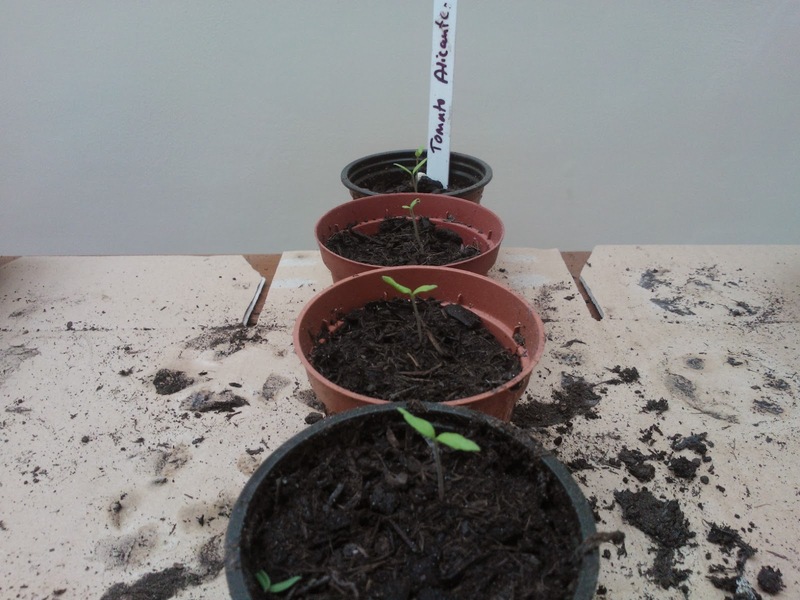 I also have tomato plants recently germinated along with melons and peppers. Not sure where these are going to go yet as I don’t have a greenhouse but I’m sure I’ll find somewhere. All in all plenty of encouraging signs with a few minor set backs on the way. As many gardeners will know this is often the way and nothing to get dis-heartened about. With March soon upon us the garden will come into it's own the seedlings will become plants and everything will start to grow. i for one can't wait. You are right, it is all ups and downs at this time of year. I think we are so desperate for spring we want to chivy it along a bit. It will be here soon enough and I can't wait either!